TORONTO, Oct. 30, 2018 (GLOBE NEWSWIRE) -- QMX Gold Corporation (“QMX” or the “Company”) (TSX:V:QMX) is pleased to announce that it has entered into a custom milling agreement for the Aurbel Mill in Val d’Or, Quebec with Gowest Gold (“Gowest”) (TSX:V:GWA). Funding for the restart of the Aurbel Mill subject to conditions set out in the agreement. The arrangement is conditional on obtaining an amended permit to receive and process third-party material and the successful restart of the Aurbel Mill. Gowest has committed to funding the restart of the crushing, grinding and flotation circuits, which were winterized in mid-2016 following the termination of mining activities at the Lac Herbin Mine. The Aurbel Mill is located 15 kilometres east of Val d’Or and 8 kilometres north of highway 117. The processing plant utilizes conventional crushing, grinding, gravity, flotation and cyanide leach circuits to process gold-bearing material. The facility is also amenable to modification and customization in order to tailor throughput and target recoveries to the specific metallurgical requirements of the feed material. QMX Gold is pleased to welcome Andrew Cheatle to the Board of Directors. Mr. Cheatle is a highly regarded exploration geologist and mining executive. Mr. Cheatle will replace Bruce Humphrey who has elected to step down from the Board of Directors effective immediately in order to pursue other opportunities. We would like to thank Mr. Humphrey for his valuable contribution throughout the significant restructuring QMX Gold underwent in 2016 and the restart of our exploration activities. We wish him all the best in his future endeavors. QMX Gold Corporation is a Canadian based resource company traded on the TSX-V under the symbol “QMX”. The Company is systematically exploring its extensive property position in the Val d’Or mining camp in the Abitibi District of Quebec. QMX is currently drilling in the Val d’Or East portion of its land package focused on the Bonnefond plug and in and around the Bevcon Intrusive. 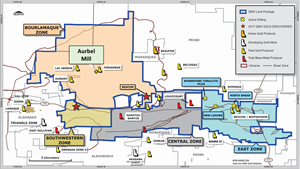 In addition to its extensive land package QMX owns the strategically located Aurbel gold mill and tailings facility. This press release contains or may be deemed to contain “forward-looking information” within the meaning of applicable Canadian securities legislation. Forward-looking information includes, but is not limited to, statements regarding future plans, operations and activities, projected mineralization; the entering into of the custom milling agreement with Gowest; the specifications of the mill; the ability of the Company to generate revenue as a result of the custom million agreement; and the appointment and resignation of directors. Generally, forward-looking information can be identified by the use of forward-looking terminology such as “plans”, “expects” or “does not expect”, “is expected”, “budget”, “scheduled”, “estimates”, “forecasts”, “intends”, “anticipates” or “does not anticipate”, or “believes”, or variations of such words and phrases or state that certain actions, events or results “may”, “could”, “would”, “might” or “will be taken”, “occur” or “be achieved”. Forward looking information is subject to known and unknown risks, uncertainties and other factors that may cause the actual results, level of activity, performance or achievements of the Company, its properties and/or its projects to be materially different from those expressed or implied by such forward-looking information, including but not limited to those risks described in the disclosure documents of the Company filed under the Company’s profile on SEDAR. Although the Company has attempted to identify important factors that could cause actual results to differ materially from those contained in forward-looking information, there may be other factors that cause results not to be as anticipated, estimated or intended. There can be no assurance that such information will prove to be accurate, as actual results and future events could differ materially from those anticipated in such statements. Accordingly. readers should not place undue reliance on forward-looking information. The Company does not undertake to update any forward-looking information, except in accordance with applicable securities laws.